Technology for tinnitus and hearing devices continues to raise the bar. 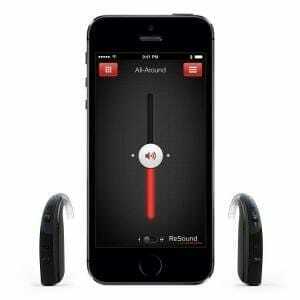 With the Resound LiNX2, we can now offer hearing instruments that can be combined with sound therapy for tinnitus treatment and sync with your iPhone. They are small, powerful, and very easy to use. Not to get too technical, but there are several ground breaking benefits of these devices that use a clear, ear to ear 2.4 GHz platform. As you go about your day, these devices remember the different settings you used in different locations. For example, when you head into work or the gym, the ReSound LiNX2 will know and either automatically adjust or ask you if you would like to do it yourself. This converts your smart phone into a remote control for your hearing instruments. It adjusts everything wirelessly from your phone such as volume, pitch, and program used by the devices. For people living with tinnitus, this creates unique soundscapes to mix with your tinnitus to provide relief. You can use their pre-set soundscapes or import your own favorite soothing music to mix with us to five other sounds like ocean surf or pink noise. You can take your iPhone or iPad and transform it into your own custom microphone. Once activated, the immediate environment is then seamlessly streamed into your ears in stereo using frequency compression. Never lose your hearing instruments again. With the app that connects to these hearing devices, you can see where they’re located on a digital map. This feature is called “Find My Hearing Aid”. All of us are getting accustomed to the way smart devices can be customized to fit our personal preferences. Many of these options are available through the app as well.